- When Running Premium Monthly, cargo space on ship allows more to be held, but doesnt show it with a greater amount. - Gen Raiders don't help each other in same node. - Premium XP production needs to be rounded up. - Premium prizes in chat box don't reflect actual bonus. - In addition, downloading patches was slow as hell - but I guess thats going away when moving to steam? I think we should remove that, ie when the mouse hovers a search result it doesnt fill it in the text box. - Nereid is still unavailable in game right? Is this coming up? - repair price for hyperion moth is crazy, 52k for <10% hull, is that how its gonna be? - you know what else would be very welcome? a shorter path to repair the ship, right now you have to wait what seems to be eternity ( ) for the animation to take place getting in hangar... I need click click launch man!! a bit curious about the 0.05%, is this even doing anything? so after spending around 2mil ill have extra 1% dmg or speed? seems weird..
-- when i want to switch targets when im engaging, it requires to disengage and reengage ie 2 clicks instead of one, can we make that one click? - guns view on the HUD on the bottom left doesnt seem to be very helpful, esp when you got >2 guns right? you have to click through all your 9-12 guns.... maybe a more compact view to show all like in pDiaspora? - also noticed that I cant really upgrade anything about my guild, why is that? I'm going to add onto the buy menus issue. All planet menus need a colour/opacity change. As is, especially for me as a colour blind person, I can barely make out any of the menus. Light blue-ish colours look cool and all, but are too hard to see when they are a similar colour to the background/sky. Need something darker to contrast for visibility. Perhaps a slightly dated look, but even leaving them the colour they are but putting a thin black line around them and the letters? That way on bright planets you can see the menus and what they say, yet on darker planets having the lighter colour on menus would have them enormously visible. Or another option, adding an opaque black sort of shadow like background to the menus? We just need something to contrast to make them visible on lighter planets/hangar but won't affect them on darker planets. Integrated chat window as part of the cockpit hud would also be great, rather than constantly having to minimize/enlarge chat. Perhaps move the space/cargo to that lower button on the hud below party/quests/etc that is currently unclickable and put the chat window in that lower right corner? Or even switch their position all together, making the cargo window the collapsible window and the chat static in the corner? Because being able to see chat at all times is more important than "Oh hey there happens to be some cargo in this node I just jumped into and I didn't have to actually manually check". AI.... increasing their difficulty is wise to keep the game interesting, but the difficulty needs to be reflected in the reward. Lowering their xp handouts while increasing their difficulty will result in zones, especially early zones, crammed to the brim with players fighting over scraps, for hours/days on end, severely decreasing progression, and inevitably costing you players. If progression is too stagnant, returning players probably will stay because we love the game so much, but new players? Doubtful. Difficulty in higher zones should be comparable to player levels, but the lower zones?.... those should be left as were difficulty wise with decent xp gains to allow players to get out faster. Plus the point of a starting zone is to get them used to the controls, and then get them out into the world, they shouldn't be stuck in there for days on end because they have to farm out at least to rank 3 before heading out because the outside galaxy is far too difficult with large jumps in AI difficulty between relatively close areas of space. So atm it seems like new players are going to be crammed into gen until like rank 3, then crammed into upper neutral till rank 5? Won't even see a Rin till rank 6? Long grinds for higher ranks is fine and all, but a long grind for a lower rank is certainly going to turn players away. Excuse my mad paint skills. And I stole some guy's picture but I just don't have the game on this computer so can't make proper screenshot. The picture speaks for itself. We need more intuitive HUD. The current one is also too shiny/bright and after some time my eyes are going to bleed. 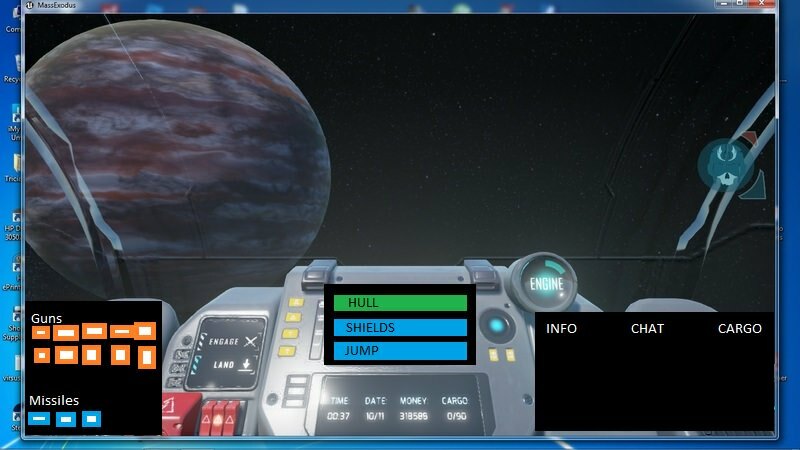 - Menus at the planets are too hard to read. - Make Hangar default position to be the current active deck so there will be no animation when people go there to repair. - Double click on something to engage. - Right click to remember for scanning. - Fix auto-correct when scanning. - "Enter" to open chat. - Make an option to remove particle effect like smoke and explosion when getting hit. Currently when hit rank 3 people go to Rin zone which is fine. But then they are stuck there because there is no Nereid bots around Crontas etc. So everyone is in the Rin zone waiting for jump research so they can go to Kaydin. We need these nereid bots - they are like the step between Rins and Kaydin. All great suggestions, I will go over my patch goals in another thread. Quick note on the research at .05 I think it's supposed to be a half point at .5 and is either a typo or an error on insert.